Dallas Mavericks fans have anticipated it. NBA commissioner Adam Silver assumed it. But all season long, Dirk Nowitzki wouldn’t confirm it. Following a 30-point effort in a win over the Phoenix Suns, Nowitzki announced that he’s retiring from the NBA. The news came on the heels of a season full of speculation over Nowitzki’s future plans and a pregame setup that hinted that this might be his last game in Dallas. “As you guys might expect, this is my last home game,” Nowitzki told an American Airlines Center crowd that forced him to pause his postgame speech to give him an ovation. “I’m trying my yoga breathing but it’s not really working that well,” he joked as he choked back tears before thanking Mavericks owner Mark Cuban, coach Rick Carlisle, his teammates and fans. NBA legends showed up to honor Nowitzki as Charles Barkley, Scottie Pippen, Larry Bird, Shawn Kemp and Detlef Schrempf took part in his retirement ceremony. 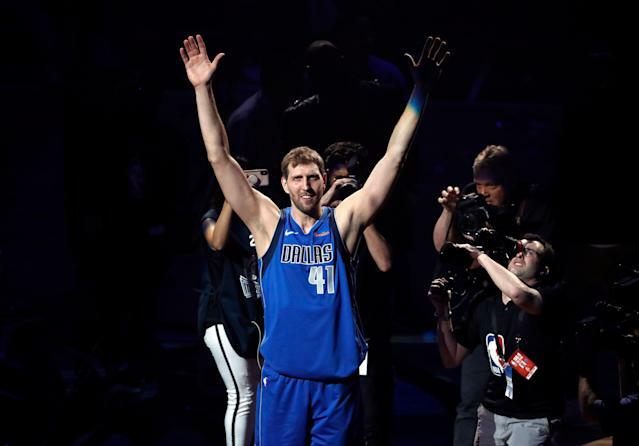 Nowitzki received a hero’s welcome from hundreds of team and arena employees at American Airlines Center as he arrived for the home finale against the Suns. The team also provided oversized Dirk heads in every seat to commemorate the occasion, hinting that something more than a basketball game was in store. Nowitzki got the start against the Suns and one last roaring ovation from the Mavericks faithful in pregame introductions. Nowitzki, who averaged 6.6 points per game this season, went on to score the first 10 points for the Mavericks as no other Dallas player took a field-goal attempt until Devin Harris’ 3-pointer at the 7:25 mark of the first quarter. He ended with 30 to help the Mavericks overcome Jamal Crawford’s 51-point effort in the 120-109 win win over the Suns. Nowitzki retires as one of basketball’s transcendent players, an NBA icon without a hole in his résumé. Nowitzki made 14 All-Star games and earned All-NBA honors 12 times in his 21-year NBA career played entirely with the Mavericks. He won league MVP honors in 2007 and led the Mavericks to their only NBA championship in 2011, defeating a loaded Miami Heat team that featured LeBron James, Dwyane Wade and Chris Bosh, winning Finals MVP honors in the process. A 7-footer with a sweet jumper, Nowitzki helped usher in the modern NBA that demands its big men stretch the floor and shoot from distance. His fadeaway jumper was one of the game’s most unstoppable weapons, leaving defenders helpless to challenge a shot they couldn’t reach. Nowitzki averaged 20.7 points, 7.5 rebounds and 2.4 assists while shooting 38.1 percent from 3-point distance over his 21 years in the league. He leaves behind a legacy as one of basketball’s greatest offensive players and a beloved icon in Dallas and beyond.